Rosa is Maisy's daughter, when we originally bought Maisey Rosa had already been sold but we were contacted later as her new owners had different financial circumstances due to the credit crunch and they could no longer keep her. Rosa is still growing and so is out at grazing at Newlands Bishops farm with bertie until she has matured and can be broken in. She has done some in hand showing and is being handled. Rosa should start to be lunged next year and will be gradually broken in when she is old enough. We hope that she will do more in hand showing as she is very pretty and she may be broken to drive. Rosa is much more settled now in a group lesson and in individual lessons. 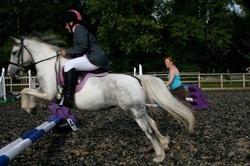 She is good for a variety of riders on the flat and over jumps. We look forward to showing her in the coming season.